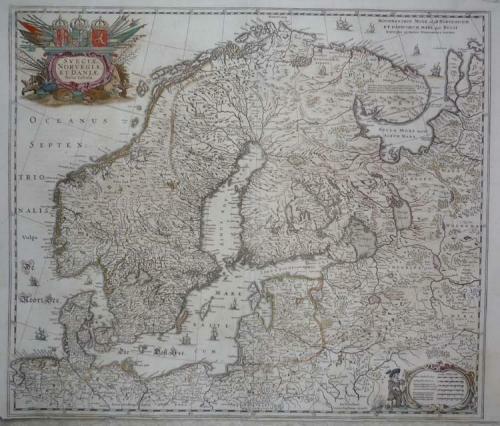 Title: 'Sveciae, Norvegiae, et Daniae Nova Tabula' from "Atlas Novus sive Theatrum Orbis Terrarum..."
An elegant map of Scandinavia with a wealth of detail. In very good condition with a tight lower margin, with slight colour oxidation repaired at the back side. The middle fold down has a small repair, and there is a small area of paper thinning near the lower right margin with very slight paper cracking (only visible when held to the light).